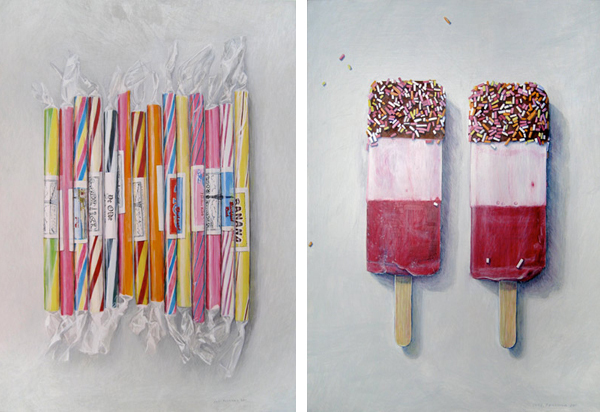 Loving these Wayne Thiebaud inspired food paintings by Joel Penkman. Hmm. I think I'm loving them, too. The popsicles are like none I've ever seen before--I'm going to say it's a cherry/lemon/chocolate combo with sprinkles on top. Sounds good to me. aw love these! so sweet. xo jillian:: ps im hosting a judy kaufmann print giveaway! I was going to say they remind me of Thiebaud but with less melancholic colours. I loved these too! The ones you chose were my favorite. After seeing his website though I think "Pink Wafers" may be my new favorite. Wayne Thiebaud has always been one of my favorite painters - these inspired pieces are just great! At a first glance, didn't even realize they were paintings! Yummy. I've seen his art pop over all over the place! I love it - it makes me so hungry to look at!